Luciano Pavarotti once said, "One of the very nicest things about life is the way we must regularly stop whatever it is we are doing and devote our attention to eating." My fourth annual recap of my favorite bites and meals reminds me that I pay attention to things like noodles, pickles, dairy products, booze, and obsessive people. From bowls of steaming noodles, to the best pork belly on the other side of the Mississippi, I noshed on morsels prepared by devoted chefs using ingredients raised by dedicated producers. These bites were usually shared with sweetheart friends, family members, friendly strangers, and/or the ever-awesome mustachioed gerg. L'ETOILE. Tory Miller, owner and executive chef at L'Etoile and Graze, was named Best Chef in the Midwest by James Beard in 2012. Lucky for us, two of his restaurants are located in Madison, Wis, which is just over the river and through the woods from Minneapolis. I visited both restaurants this year, but one dish at L'Etoile was particularly noteworthy. It was a crispy Willow Creek pork belly small plate served with yellow doll watermelon "kimchee" and then topped with a little frisée, fried peanuts, cilantro, and scallions. The salty pork belly paired with the fresh, tangy fruit was the bombdiggity. LANTERN. As for James Beard winners, Andrea Reusing was the 2011 winner of the James Beard award for Best Chef in the Southeast. Gerg's sister and her husband treated us to dinner at Reusing's restaurant, Lantern, in Chapel Hill, NC. I ordered the crispy slow-cooked duck soup with fresh egg noodles, oyster and shiitake mushrooms, Shanghai bok choy, and scallions. The egg noodles were dreamy. The crispy duck added body and flavor to a broth that jived with the mushrooms and fresh scallions in a good way. And the dessert - roasted banana ice cream with caramel, soft cream, and locally made peanut brittle - was aces. Bananas never tasted so good. THE OLD FASHIONED. The Old Fashioned Tavern and Restaurant in Madison, Wis, was a semi-finalist for the James Beard award for outstanding bar program in 2012. As I enjoyed many old fashioned libations there, I also ordered the #7 Appetizer THRICE in 2012. Check it out; they load a "lazy Susan" with local dilly beans, deviled eggs, dill potato salad, pickled beets, poppy seed coleslaw, dill pickles, Widmer’s Brick cheese spread, Vern’s Sharp Cheddar cheese spread and then set it in the middle of your table with a side of crackers and rye bread. It's about as irresistible as a Donald Driver Lambeau leap. SINGING HILLS GOAT CHEESE. Singing Hills Goat Dairy is Minnesota’s goat farm darling on the interwebs. Lynne Reeck and Kate Wall operate Singing Hills Goat Dairy, a 25-acre farm in Nerstrand, where they’re raising goats and crafting fresh, artisan goat cheese. Light and mild, the brine on their slabs of feta-style goat cheese gently coaxes the milky flavor from the cheese. And their fresh curds are soft, slightly salty, and squeaky between your teeth. We made a homemade homerun this year - Singing Hills feta piled on a rosemary, parsley, and garlic seasoned lamb burger, with olives. KATANA-YA. On a cool and misty afternoon in San Francisco, I took a chance on Katana-ya Ramen. The waiting line at the joint is legendary, but when I wandered there at 4pm on a Tuesday, I was seated promptly. I immediately ordered a bowl of the Katanaya Ramen - ramen noodles in a miso broth served with corn, fried chicken, fried potatoes, seaweed, scallion, bbq pork, and boiled egg. The noodles were oh-so silky and the miso-based broth was complex and soothing. BOURBON and BRANCH. While lounging in my hotel lobby in the Tenderloin district of San Francisco, I met a gal who eventually squealed, "Oh! You're a foodie!" As I owned up to my foodie status, she invited me to join her for a drink at a nearby speakeasy, Bourbon and Branch. Yep, I was reluctant, but it was just around the corner, she was wearing dope eyeliner, and she had a reservation and the password. We had a blast. Despite the passwords, rules, and goofy guests, the cocktails were on point. They had a bunch of hand-numbered bottles, and some real gems like Rittenhouse 21 Year and Glenmorangie Margaux Cask Finish. INDEED. Adding to the growing list of Twin Cities’ taprooms, Indeed Brewing Company opened their taproom located in the Solar Arts Building in NE Minneapolis in August. We've taken a shine to the founders, friends, and college roommates Tom Whisenand, Nathan Berndt, and Rachel Anderson (along with Nathan's wife Nancy and her rad sisters). Although we've enjoyed their seasonal beers, we keep coming back to their citrusy Day Tripper Pale Ale and the sweeter (and slightly chocolatey) Midnight Ryder American Black Ale. 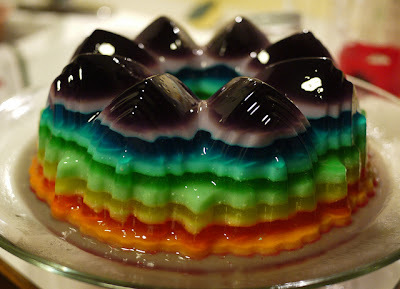 AMAZBALLS JELLO MOLD. My gal pal, ShannyPants, just had to make a boozyjello mold for Halloween this year. She had her heart set on this 12-layer, bundt cake sized boozy jello mold, so we got together on a Friday evening and spent five focused hours making layer after layer of booze-laden jello. It was consumed in three hours at an epic party involving a flaming pizza toss. Top that. VALENTINO PASTA. Speaking of gal pals, the summer before I moved away to college, I met another gal named Marie. We spent a summer being invincible, and then I moved away. We grew apart. We grew up. Fifteen years later, writing about local and regional food, I stumbled across a new artisan pasta maker in Illinois, and discovered that my friend, Marie Valentino, was the wife of the pasta maker. Perfectly made fresh pasta is sublime, but sometimes it just isn’t practical, and for that reason, dried pasta is considered a pantry staple for most of us. Valentino Pasta in Roscoe, Ill.has taken a glimpse into our pantries and wants to improve them with this new line of dried, artisan pasta. Their duram creste de gallo pasta is a dream come true for a crema di funghi sauce. TANPOPO NOODLE SHOP. I'm a fan Tanpopo Noodle Shop, and each time I dined there before 2012, I longingly gazed at the large dining table in the dining room. You know the one I mean - the space, the lighting, and the table always inspire imaginary dinner scenarios involving a couple of handfuls of lovely people, steaming bowls of noodles, and fancy talk. This year, we finally gathered a group and made a reservation for the big table. It was just as I imagined - a group of awesome people telling bad jokes in a classy dining room slurping top notch noodles. Photo by Sarah Kriha. FROZBROZ. Ben Solberg and Erik Powers’ scratch-made, small batches of FrozBroz ice cream are making a big stir in the Twin Cities. Smooth and creamy, FrozBroz’s stellar brown butter base (used for their Brown Butter Corn Bread and Apricot Maple French Toast flavors, among others) is reminiscent of a butter pecan ice cream base, but with a much more assertive butter flavor. Local and organic ingredients are a mainstay in their flavors, and I hope they get public distribution ASAP. Picking and eating the first cherries from our tart cherry tree. A picnic operetta at the California Street Farm with farm-grown snacks. The gorgeous birthday cake that Carrie Vono made for me. I repeat, GORGEOUS. Grilled Sogn Harvest sausages from Shepherd's Way Farms. That killer soft-shell crab sandwich from Left Handed Cook. Stopping by the Pearson's house to share my CSA goodies, and being invited to dinner. Score! Entering jams, jellies, and pickles in the MN State Fair, even though I didn't win a ribbon. Winning Aimee Tritt's Pudgy Pie Contest with my Cubano pudgy pie, and winning a pie at the Toewe's Fry Fest with my pulled pork egg rolls.